What a fascinating, brilliant place. 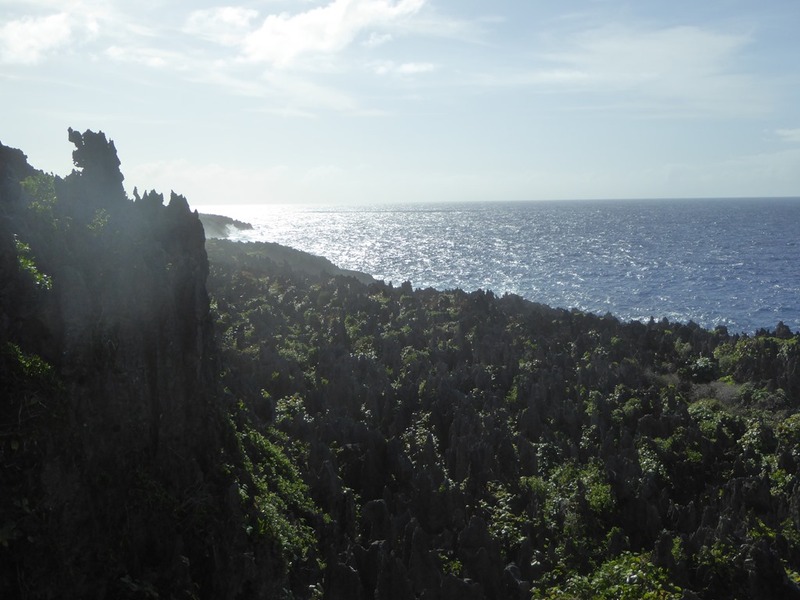 Niue is the one of the smallest independent countries in the world, the island being roughly 12miles by 8 miles. 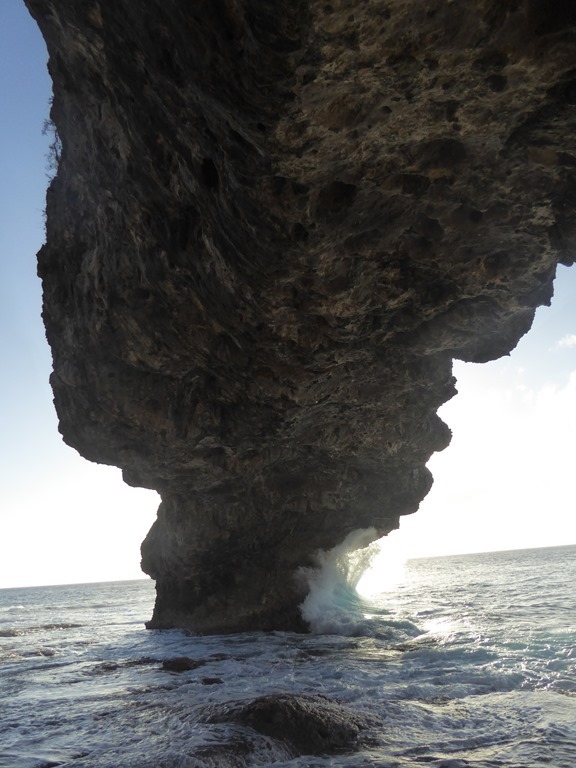 It is traditionally known as “The Rock of Polynesia”. 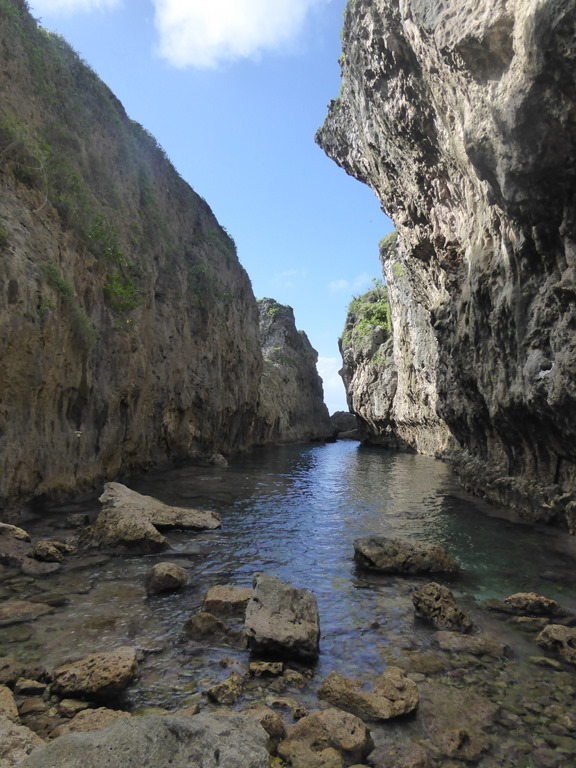 It is an uplifted coral block and there is very little reef, it standing proud with cliffs up to 30m high all around the islands perimeter. 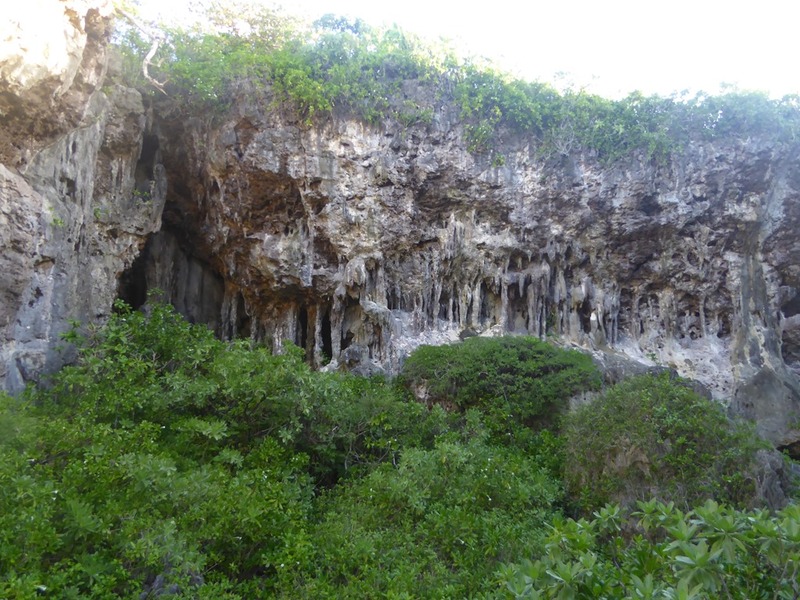 Life holds on tenuously as the soil is not tremendously fertile but there is an ancient “rain forest” on the W side of the island. Traditional farming requires a seven year rotation for the land to recover. 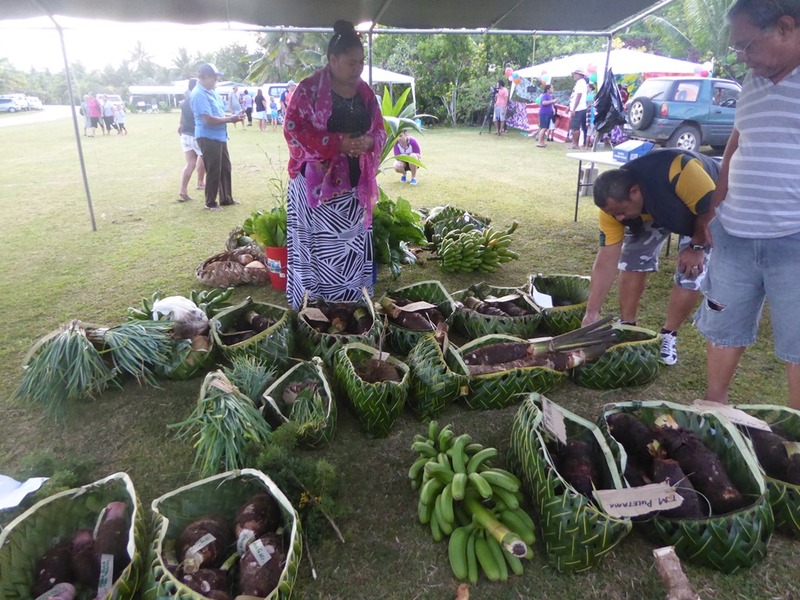 In the last few years, hydroponics has taken over and there is a large farm producing a good stock of fresh veg and salad crops which keeps the island reasonably stocked. One thing it does has is water with huge subsurface stocks easily accessible. Its closest neighbour is Tonga, some 250miles away. 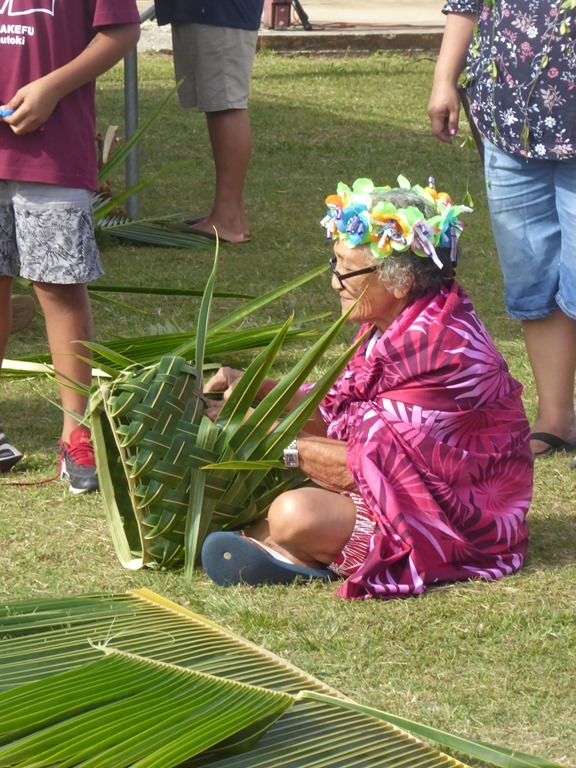 Once ruled by its kings, these days Niue uses the administrative services of NZ to allow it to interact with the outside world and the currency is the NZ dollar. It has two flights a week, increased this year from one and it gets resupplied by ship once a month. A Premier and three ministers are the senior political positions and there is a NZ Governor on the island too. Interestingly enough, we met a previous NZ governor here as well, running a bar and mini-golf course. He came, saw, loved, married and stayed on after his time ran out. 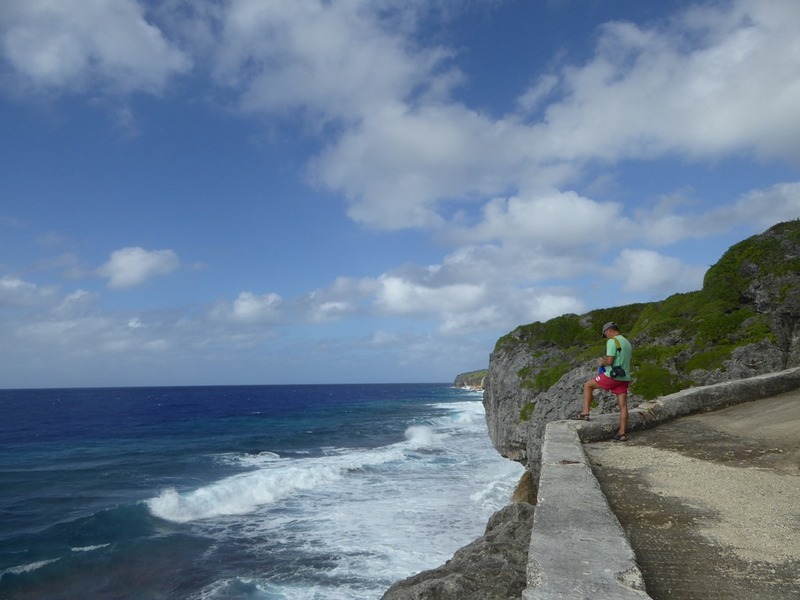 There is just something about the island, he said………..
Niue was hit very hard in 2004 by Cyclone Heta. The population before Heta was 2500 but large numbers left the island as it did a great deal of damage. The hospital, set 100m back from the sea and up a 30m cliff was washed away as was the Yacht Club beside it. A large number of houses and businesses were destroyed too. Numbers went as low as 1100. Now, some 13 years later, the population is recovering and is back to about 1900. Numbers in the primary school are at 200 and the High School is about 150. Some kids disappear off to relatives and finish school in NZ. Large numbers of the teenagers disappear to NZ for tertiary education. One I spoke to, reading Law at Auckland, intends to return to the island that she loves in her 30’s, once she has built up a war chest. The lady has a definite plan. 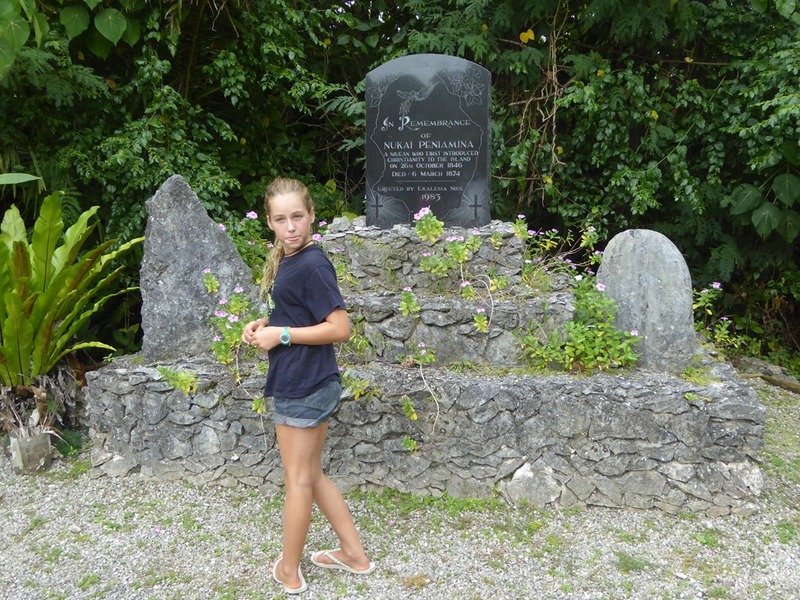 Capt Cook visited Niue and tried to land in 1774 but was beaten off by the locals three times. 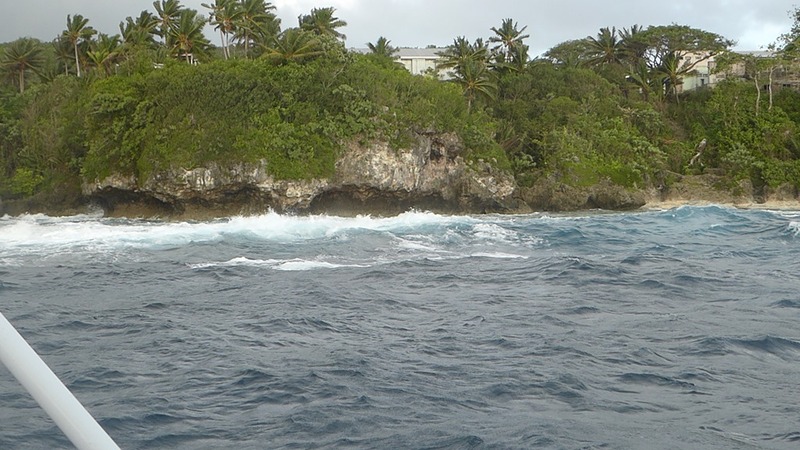 Cook’s Marines had to fire on the islanders to be able to escape and the named the island Savage Island which stuck until it reverted to Niue. 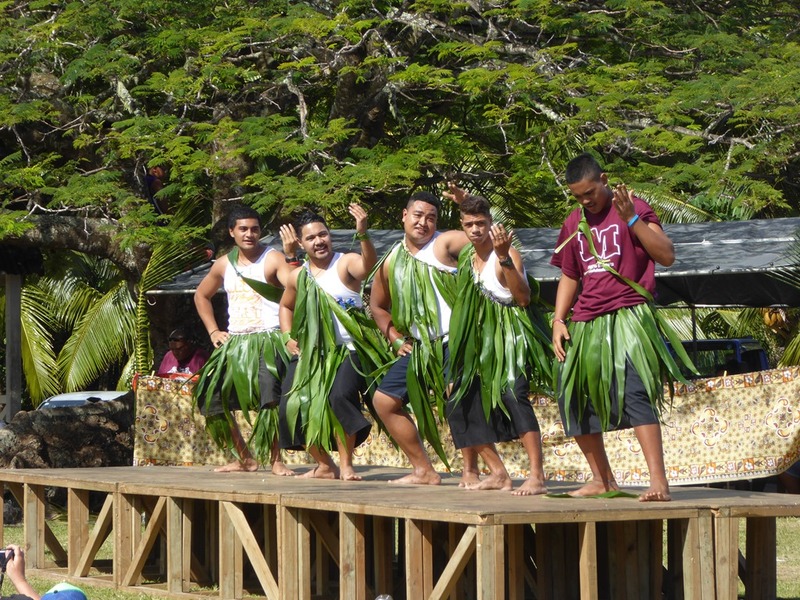 He did, however, in the very short period he was here, “plant” the flag and claim Niue in the name of His Majesty. The next foreigner that visited Nuie was some 60 years later! 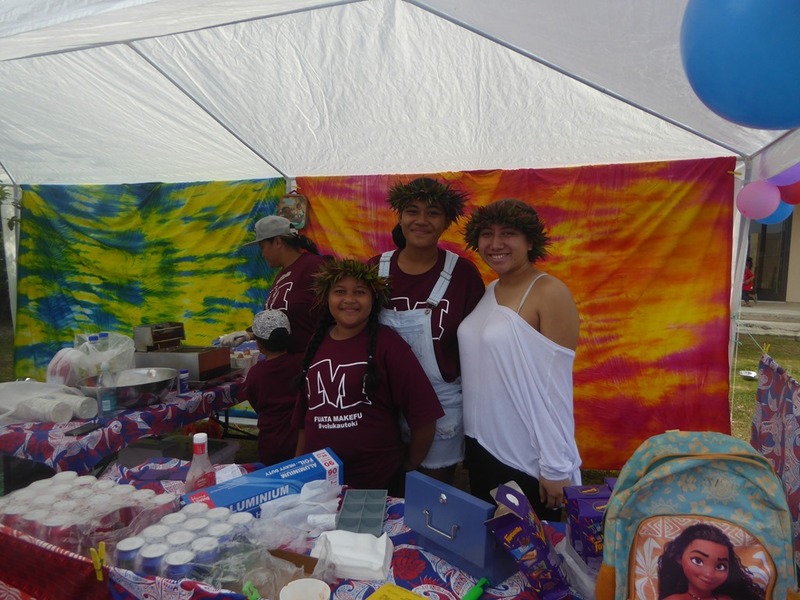 The local language of Niuem is alive and well and is the primary language taught and used in the school. English is the second language. 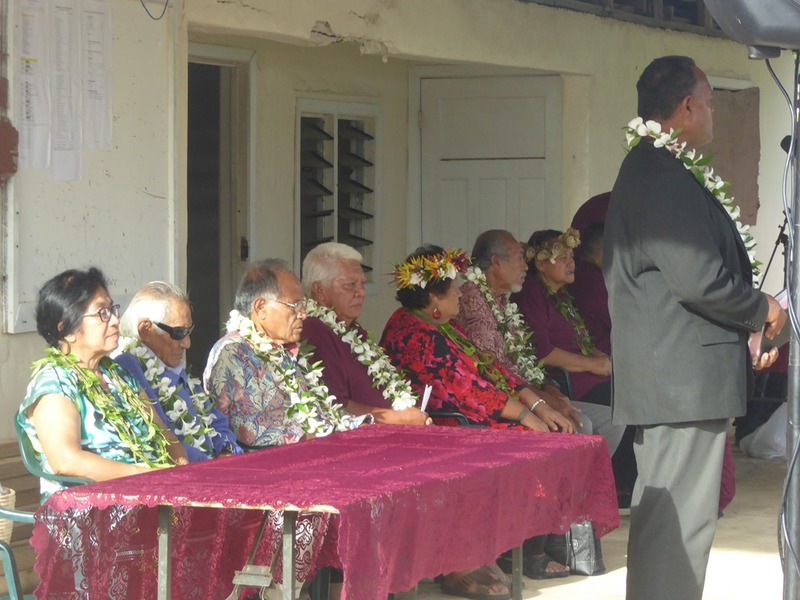 Christianity was introduced in the 1840s by a returning islander, Peniaminus, who had spent time in Samoa. We visited his grave which is kept in good order. His birthday is now a national holiday. Booking in was easy. 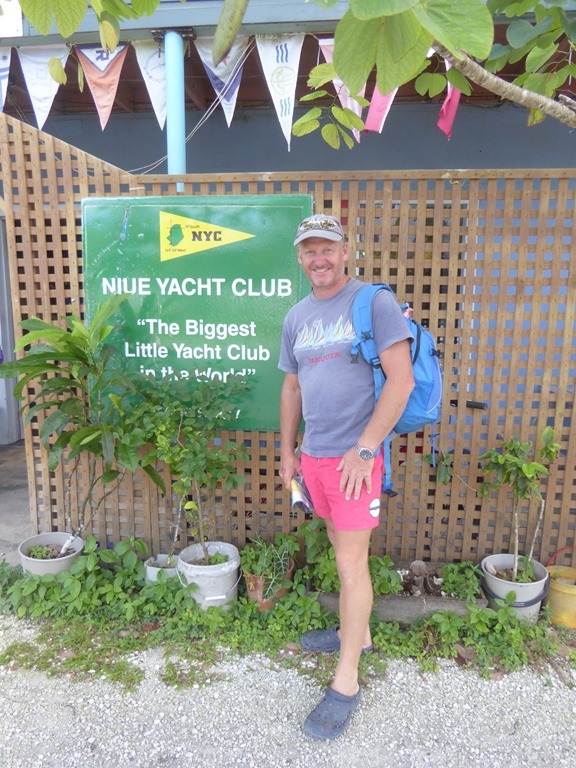 We called Niue Radio and then the Yacht Club on Ch16. 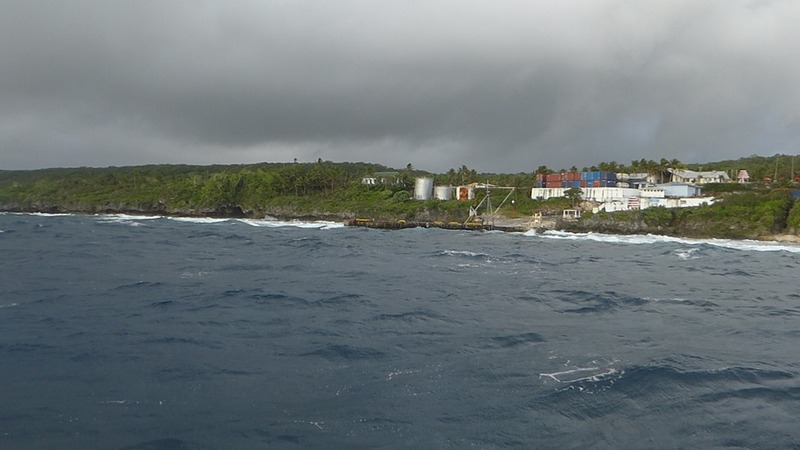 Niue Radio warned off the Customs and Immigration staff who came down to the dock to clear us in, done with big smiles. We are boat number three here this year. 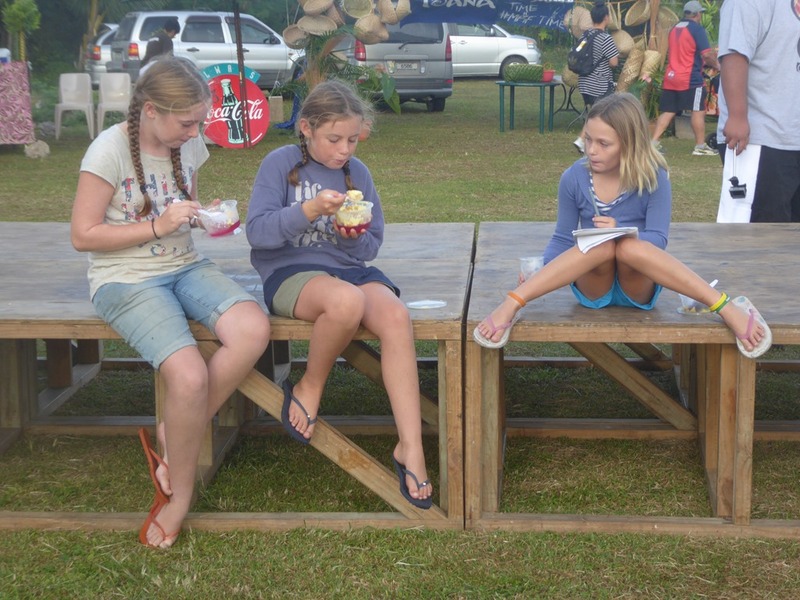 We will pay $34 exit tax per head (under 12s are free) and $15 as a one off charge for rubbish. Later this year the price is due to go up to around about $90 a head (stipulated by the NZ authorities) which I think brings it roughly in line with Cook Island charges, another NZ administrated country. The locals aren’t that happy about it as they are concerned that yachties will simply bypass them. Time will tell. 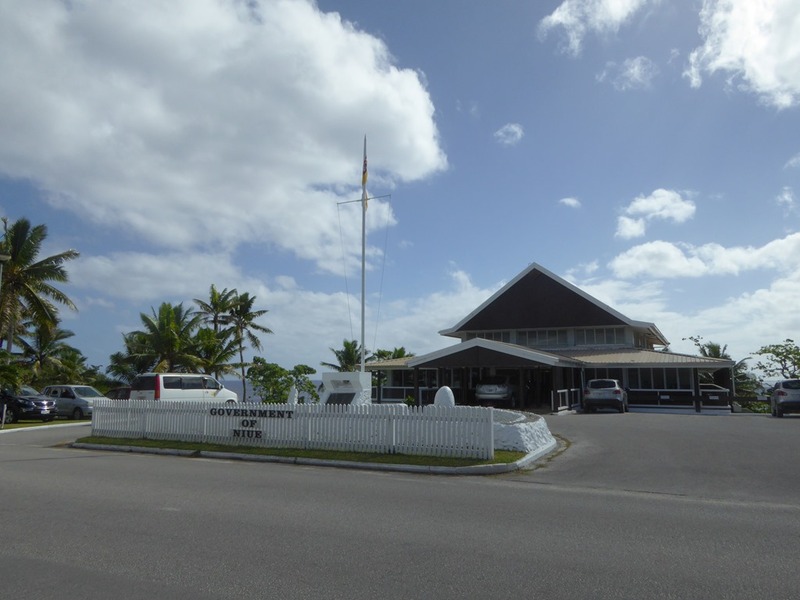 Niue Yacht Club is the biggest little Yacht Club in the world with a membership that now exceeds the actual population of the island. However, it doesn’t own a boat and the clubhouse is shared with the backpackers lodge as the old one disappeared in Cyclone Heta. Keith, the Commodore of the Yacht Club (and the OCC PO), assigned us a ball just off the jetty and then came down to say hello. He drove Peta and myself around the town to show us the sites. He is a great source of information as he runs one of the orientation tour businesses here and he can point out the local laundry, reasonable at $25 for 8kg, so much better than FP, car hire, will arrange bread and baguettes, keys for the shower block and pretty much anything else you could need. He helped us throughout our trip, taking the ladies shopping and delivering booze and heavy stuff back to the jetty, getting my dive bottles filled after I had inspected a mooring for him and generally looking after us better than anyone else has done in our whole trip. You could class it as extreme island hospitality and he obviously loves what he does but he goes well beyond what I have ever come across before. Just brilliantly welcoming and helpful. He is a star. Membership of the club is a $20 a year if you join in Niue and you get a rather spiffy membership card. The money goes a long way to pay for the excellent moorings the club maintains for visiting yachts. I’m afraid I also indulged in a burgee which I will use with pride once I get back to the UK. Fees for the use of the balls is $20NZ a night. It is a small sum for the security they offer in a place it is simply not possible to anchor at. Pay for them up at the club house, a 10 minute walk S from the jetty through the town. There is free (slow) internet and a good book exchange there too. We had been told that the water visibility was pristine and so it is. The mooring ball we were on was in 50’ of water and the bottom was crystal clear. 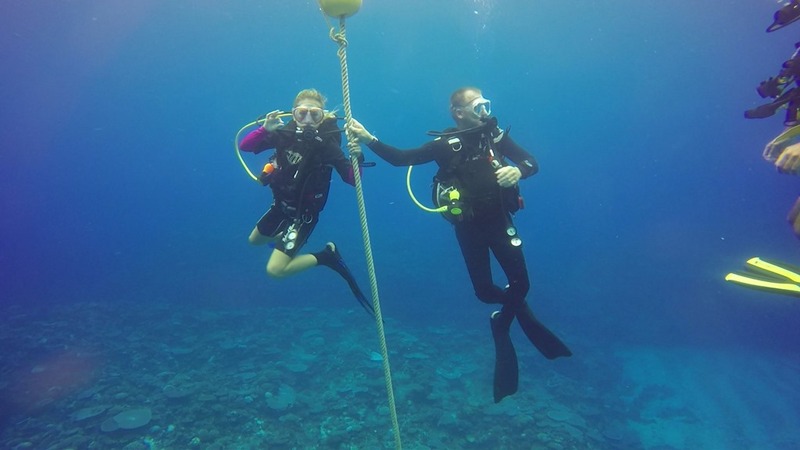 60m underwater visibility is the norm here and it can be better! 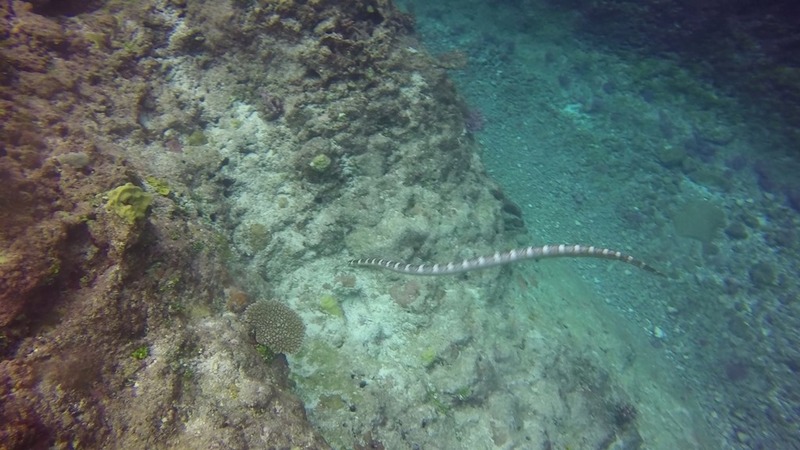 Our first visitor to the boat was one we had not seen before – a sea snake. They are inquisitive creatures and it was happy to come and have a good look at us at the back of the boat before diving for the bottom again. 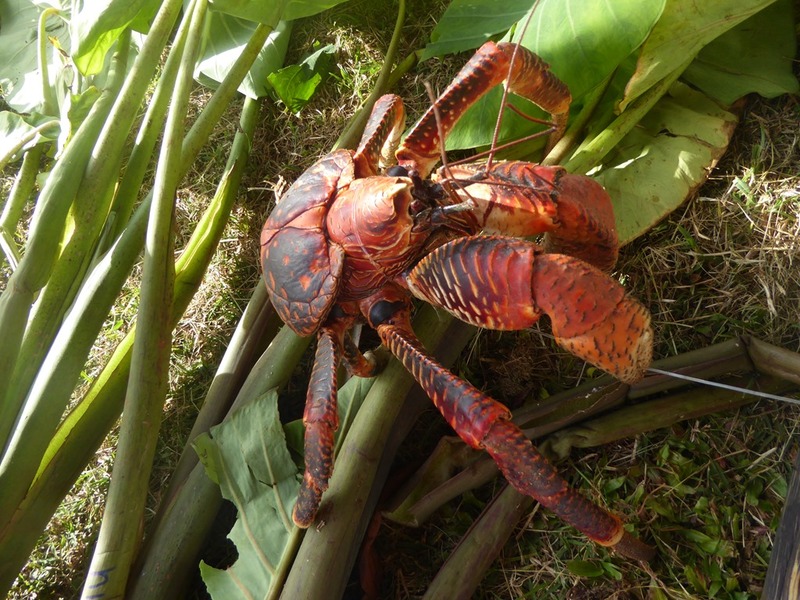 Although they are hideously poisonous, it is v v rare that they ever cause injury or death. The poison glands are set very far back in the jaw which is not big enough to be able to bite us. Our first day ashore saw us working our way through the village exploring. 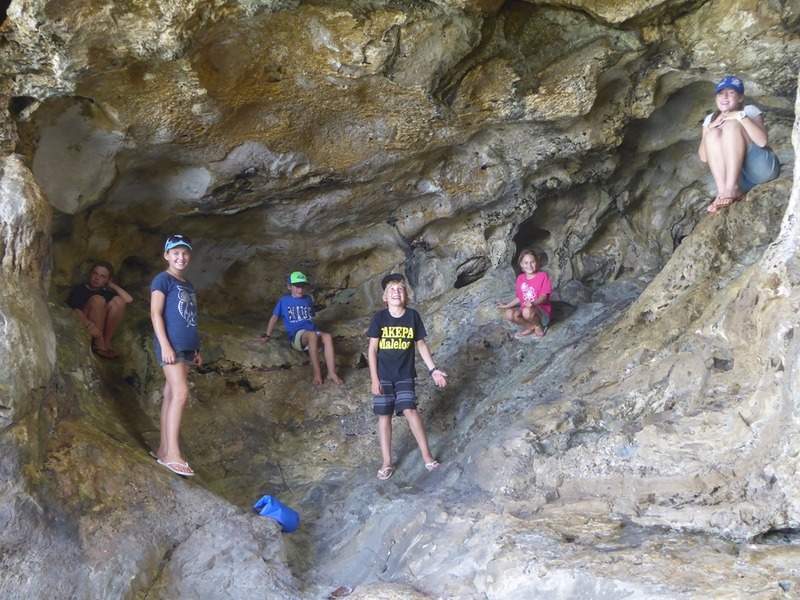 The kids took themselves off and explored the coastline caves and beaches around the town. 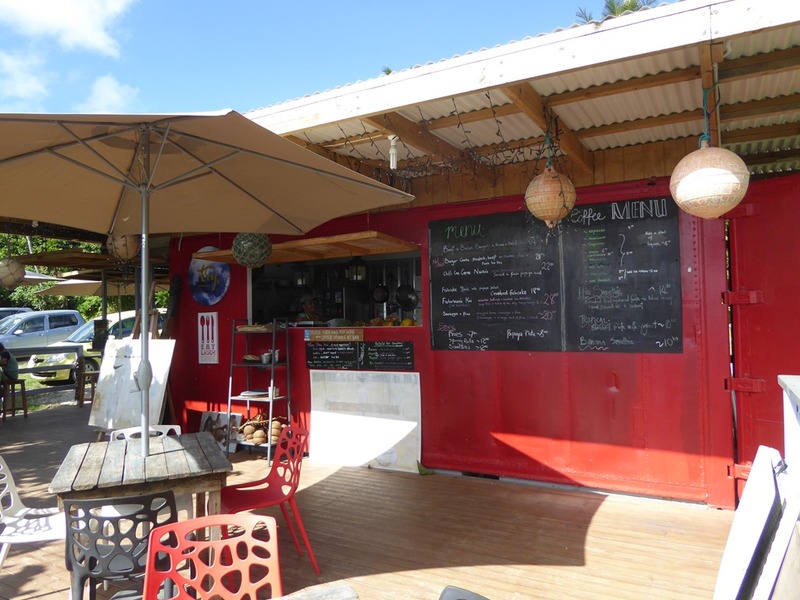 Lunch was a fantastic roti ($5NZ a pop – wow!) at the Indian restaurant in the “shopping centre”. The couple that run it are from the Punjab and thought about moving to NZ. 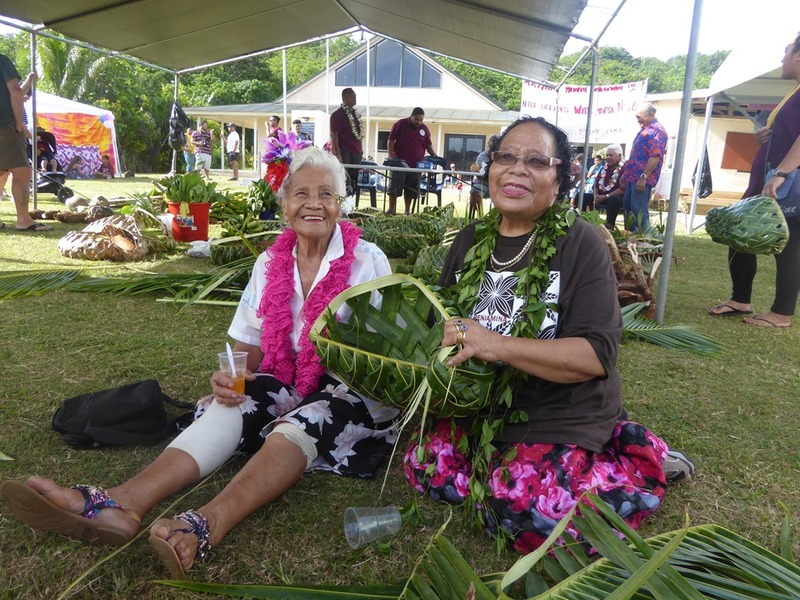 Niue proved easier to do and so they ended up here and have stayed, loving it. The public internet is pretty slow other than when sitting outside the IT network shop, a couple of doors up from the Indian. There it is good enough to Skype. If you are a local, you get free internet and have had it free since 2003, the first nation in the world to provide such. It is slated to become the first organic farming nation as well. Not bad for a wee place with less than 2000 inhabitants. These people work hard and dream large. There were three kids boats in. Be and Be, who arrived just after us and a day later, Pesto, a HR53 with Alex, Adriana, Paulo and Raquel on board. 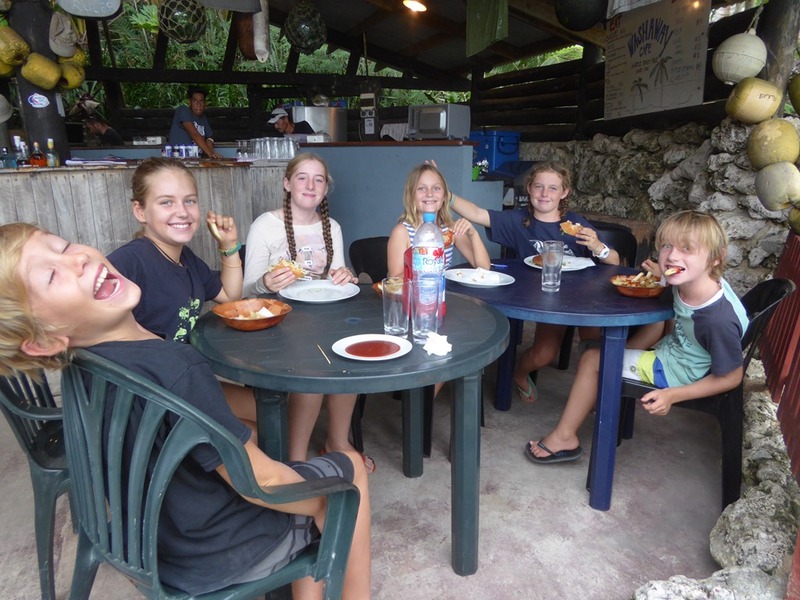 Of course, the kids went feral and had a great time on Be and Be as the adults met on Skylark for sundowners. 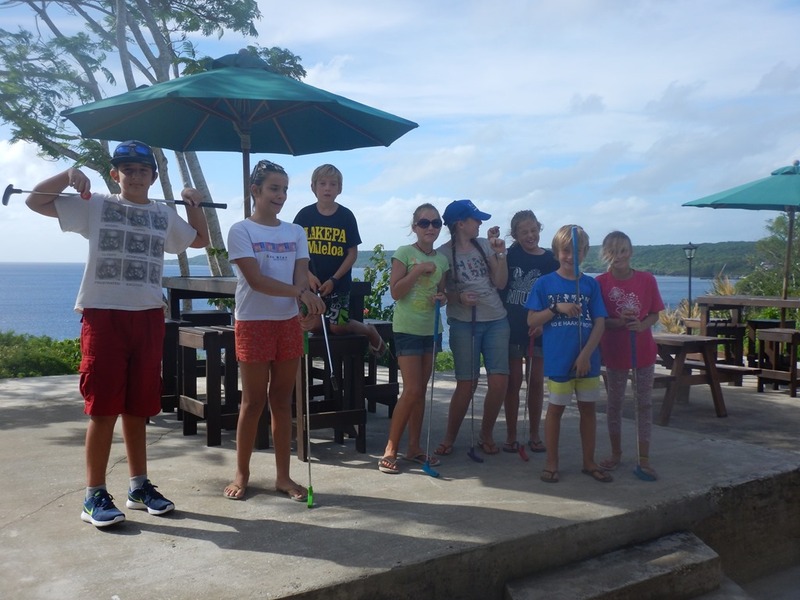 The next day, Pesto drove around the island and after school and some internet, we met up with them for the Thursday happy hour and mini-golf at the Vaiolama Cafe and Bar. The kids took nearly two hours to noisily go round the eighteen holes. The highlight for me was Evie’s hole in one at the 18th! We also visited the bond store where as yachties, we were able to stock up on duty free alcohol.The prices were fantastic. Carling Black Label 500ml cans on offer at $1NZ (or 50p) – couldn’t get that in the UK! 1l Bombay Sapphire gin at $40NZ. Wine at $10NZ a bottle. It is, bizarrely considering how remote we are, the lowest priced alcohol in the S Pacific. Sadly, Fiji is pretty strict with its duty limits so we will not going to be loading up too liberally. We decided that we needed to hire a car to be able to see around the island. Hitching isn’t done here but cars are remarkably cheap with several fair sized car hire companies on the island touting for business. 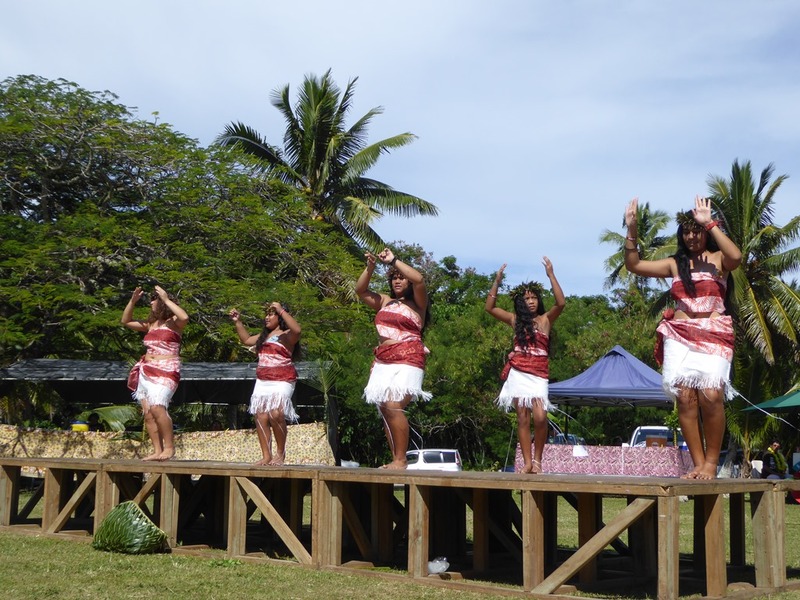 We paid $60NZ a day for an economy car from Alofi Car Hire opposite the one garage on the island. 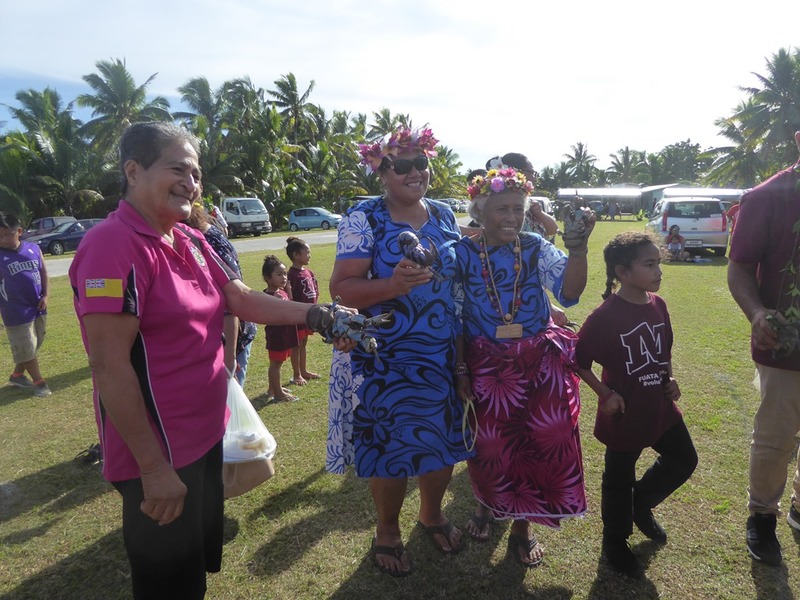 The car had aircon and we took it initially for two days, quickly extended to three days as we needed to get away from the Alofi on the Sabbath which is taken very seriously here. We had a fantastic time exploring. Perhaps not surprisingly, most of the sites are by the sea. Keith came to our aid yet again, giving Peta and myself a lift at 0715hrs for the mile and a bit to the car hire company. He then spent 15mins before the garage opened, talking us through all the best sites to see and when to see them, presenting us with a map and tourist booklet, all marked up. Friday saw us going around the whole island, visiting the main sites on the W side of the island. First stop was a 20minute walk down to Togo Chasm. 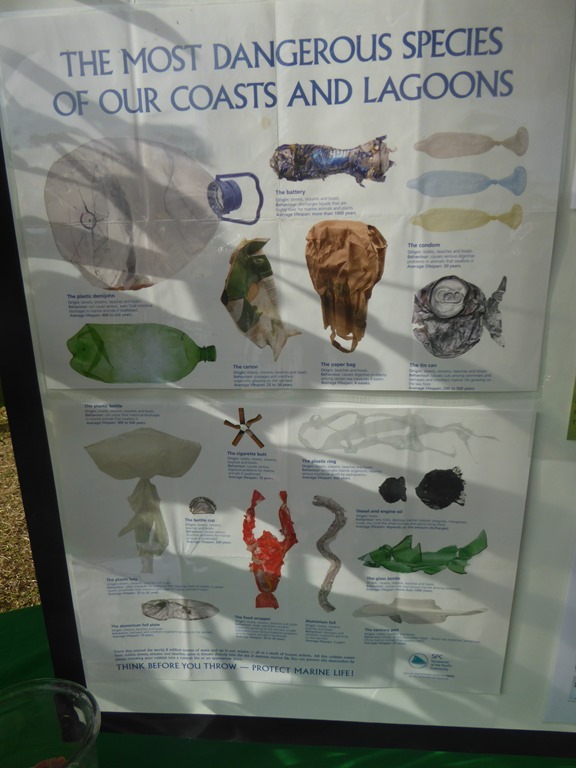 Exposed to the Trades, the seas crash along the whole E coastline and there is no relief. The old coral has been worn away in to viciously sharp pillars, very hard underfoot. You don’t want to slip walking on it. 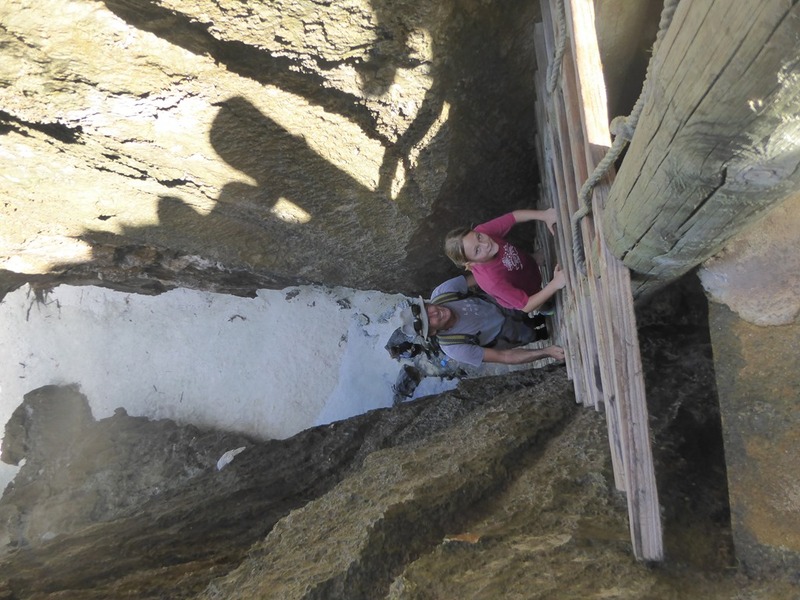 Just around the corner from the forest of ravaged coral trees there is the chasm which you gain by climbing down a steep ladder to the cavern floor. 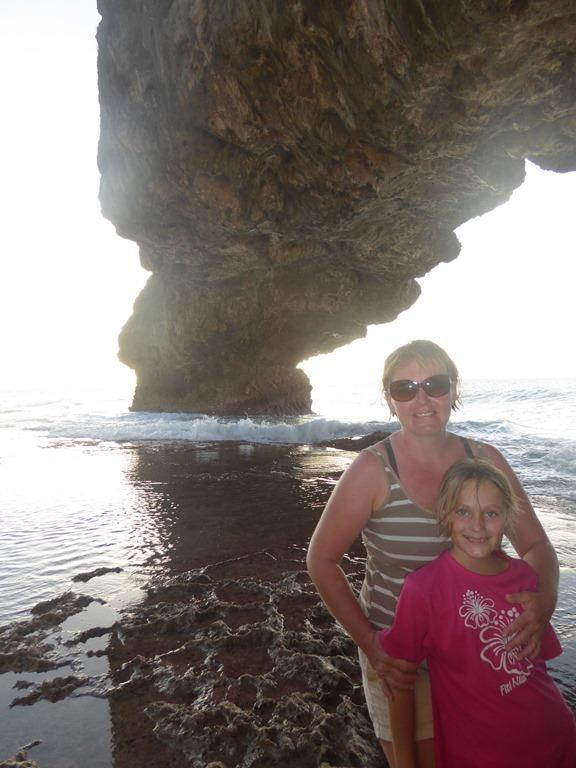 The kids had a great time exploring a cave, 50m through the cliff that led to the sea smashing its way in at this pool. The end of the chasm used to be a swimming hole but the entrance was closed up by a cyclone and is now a swamp. It didn’t smell great so we didn’t hang around long. 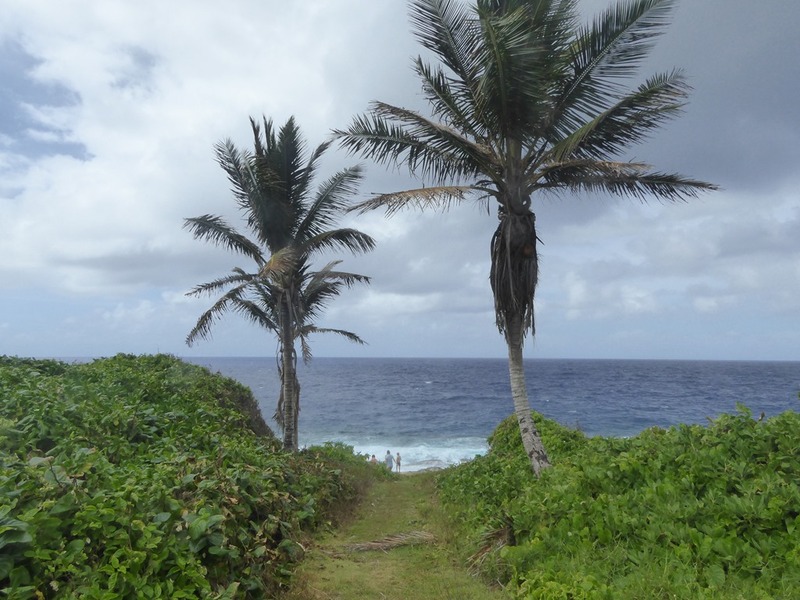 With so much to see and visit we whisked around the N coast stopping in at Uluvehi at the N end of the island. The road down to the parking area was overgrown and a little cheeky but the wee cars just managed it. 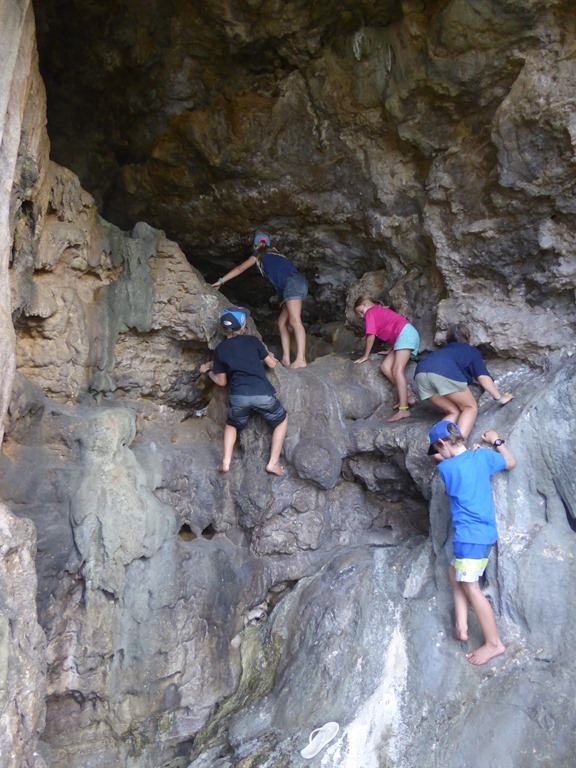 The caves were fantastic and the kids had a great time exploring and climbing them. The grown ups had to look away a couple of times as the young mountain goats with no fear scrambled up some pretty sticky places. 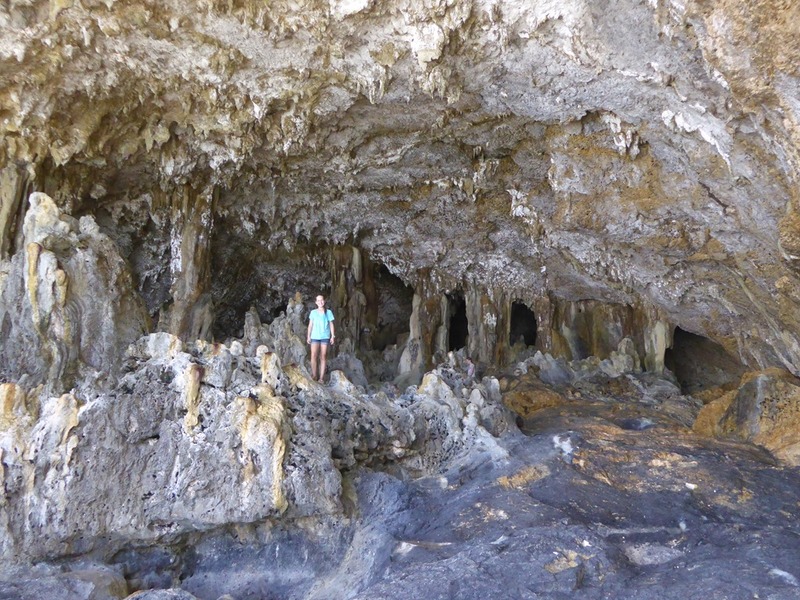 Every cave was full of stalagmites and stalactites. Leaving the kids to it, the grown ups went for the views instead. Our last stop was at Anapala Chasm. This is a fresh water pool at the bottom of a long flight of stairs which the kids all counted loudly as we walked down to them. 155 apparently. We swam the 40-50m length of the dark, cool pool. Hannah was none too keen in getting in after she had seen a baby water snake hide under a rock in the first pool but (eventually) refused to be left behind. She swam quickly to the other end in water a lot colder than the sea. The locals used to use this site for drinking and bathing water, walking the mile or so from the nearby village to collect what they required each day. On the basis that there was (on the European weather model only) a low coming through in three to four days, Pesto decided to head off on Friday morning to reach Tonga before it made it there. Geoff on Be and Be and I thought that the Low would either fail to form or would travel in a direction that shouldn’t bother us. Oh, how optimistic we were. We continued our explore of the island on Saturday and Sunday. Over the course of the year each main village has a village fair and we were in time for the first of the year at Makefu. We arrived just after 0700hrs to enjoy a full BBQ plate load of food and trifle for breakfast. 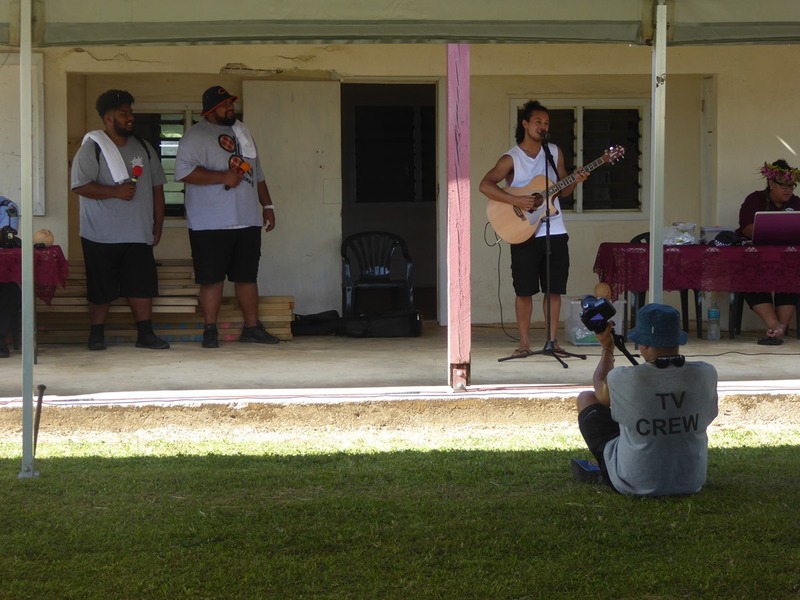 The fete started with the old and bold praising God and finished with an appearance of Tommy Nee, an local who has made it big in NZ and Polynesia as a pop star, singing about one night stands and snogging. Quite surreal. 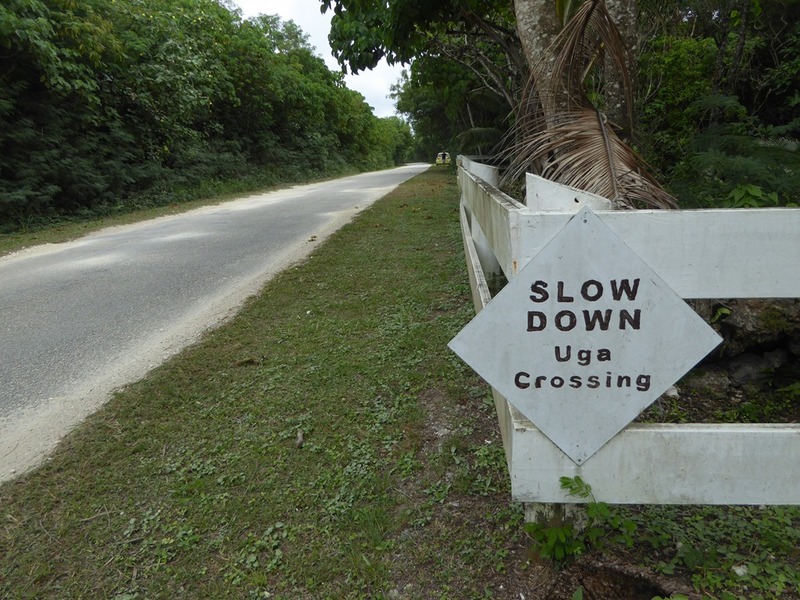 We watched Uma racing (the local name for coconut crabs) and were amazed at the speed the old ladies made a basket in a weaving competition. We watched one old lady with arthritis getting help from her sister to finish off. Great ladies who were very pleased to be attracting so much interest. Evie was presented the basket as a souvenir. 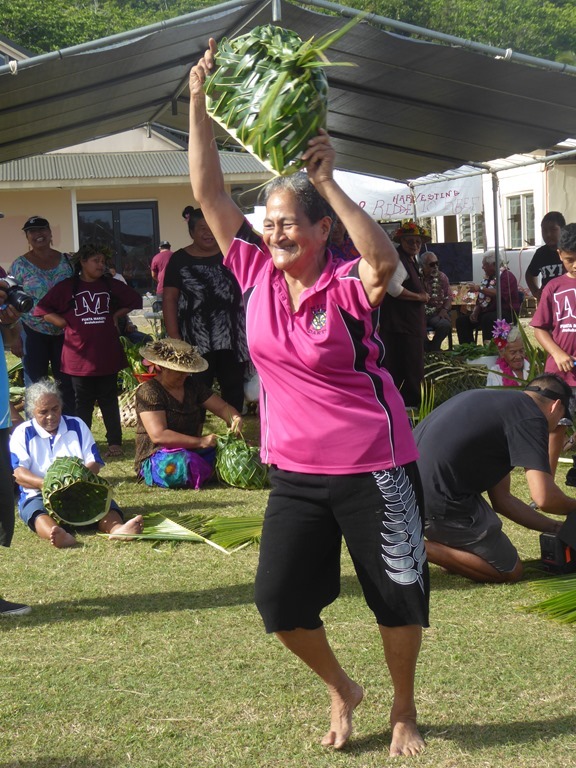 There were throwing competitions, a local spear for the men and coconuts for the ladies, before the dancing which was traditional up to the point that they had decided that the music of Moana, the new Disney film, was good enough to dance traditionally to. It was amusing to watch the older ladies jump up on the stage and stuff money into the dancers costumes. Although there are very different interpretations of that !action in the rest of the world, it is obviously the done thing here. The dancers made a fortune! The show finished by 1130hrs and we left, needing to cool down. 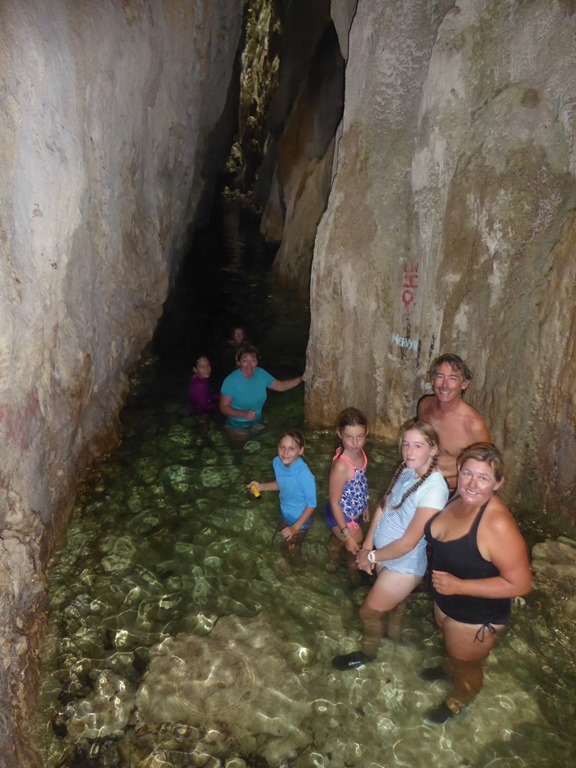 Matapa Chasm was the personal bathing pool for the King and royal family back in the day. 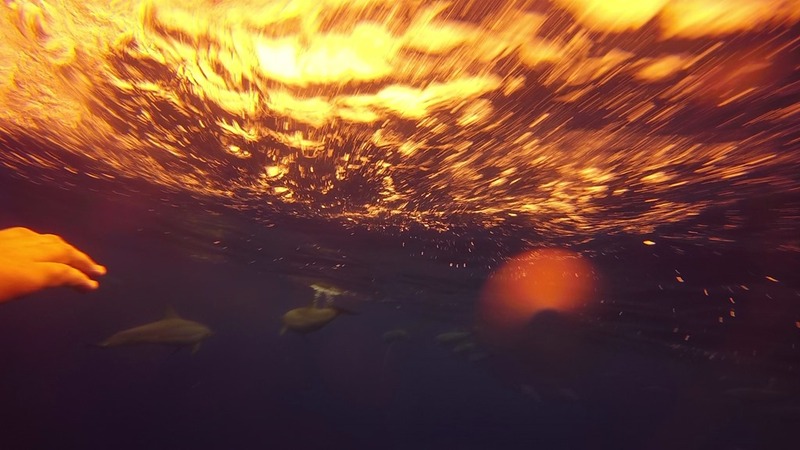 There is a cold top fresh layer from a spring sitting on the warm sea underneath. Wonderfully refreshing. There was a couple of places at about 8m height to jump in from which required a bit of rock climbing that provided some fun for me. For the more competent snorkeler you can get out to the sea but you need to be careful as the surge is strong. At every tourist hotspot around the coast there are showers. 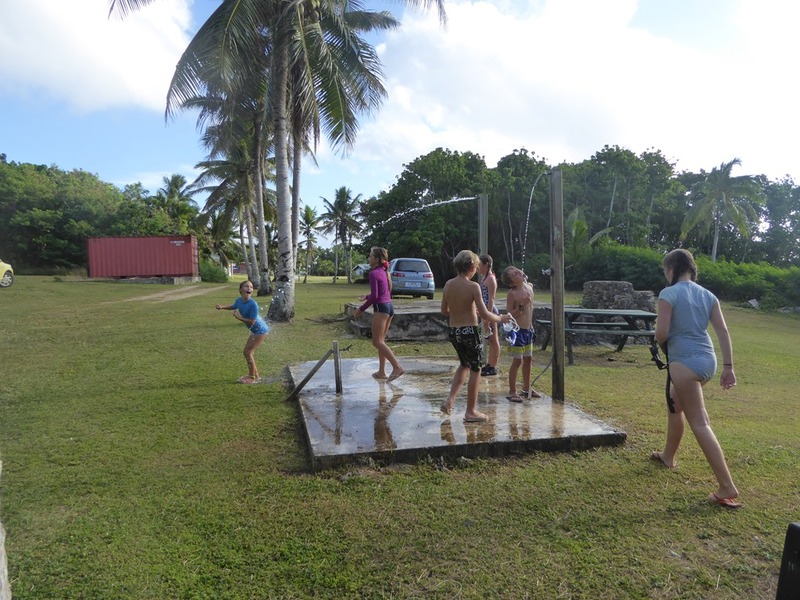 The island has so much water and as tourist numbers are relatively small, they have no difficulty in putting water pumps out to even the more inaccessible site. It is so nice not having to get back in to a car covered in sand and salt. Some of the showers had missing heads but that just proved even more fun for Hannah. It is a thirty minute walk down to the Tavara Arches from the car park and well worth it. Once used as a lookout post, now you can clamber down through caves in the rock face to the shore. You need to go at low tide to be able to reach the massive main arch. We moved on to Avaiki Cave where we met up with Tommy Nee and the two gigantic backing singers with him in an underground pool. It was nice but just around the corner we reached the main cave which blew us away. Huge and surrounded by stalagmites it is spectacular. Visiting it at low tide meant the pool was flat calm. 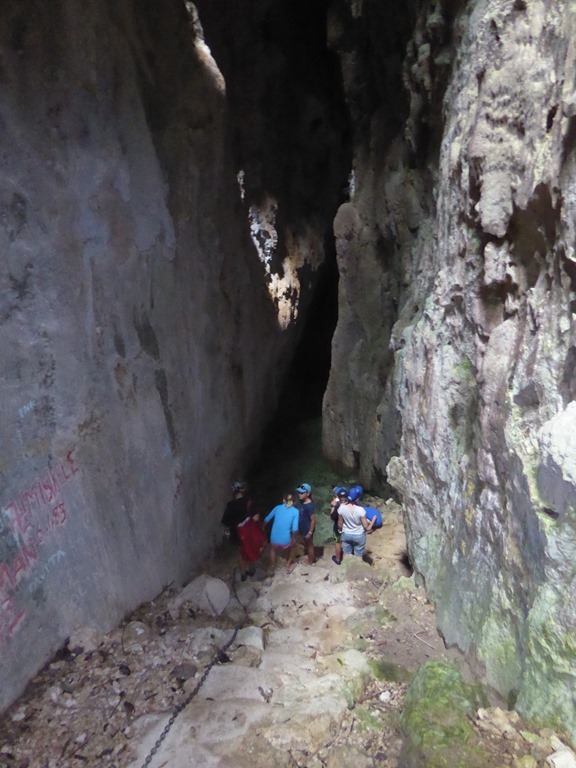 We climbed and explored right through it, needing torches for a couple of the smaller caves we found right at the back. Moving S on the W coast, we stopped at the Hio Cafe that we had driven past on our first explore. It sits above one of the few sand beaches on the island. It does an excellent lunch menu and proper coffee too. The owners must have seen the excellent use of iso containers down in Christchurch town centre as that is what the cafe is too. Limu Pools are beautiful. Deep clear water with a small inlet means protected space. 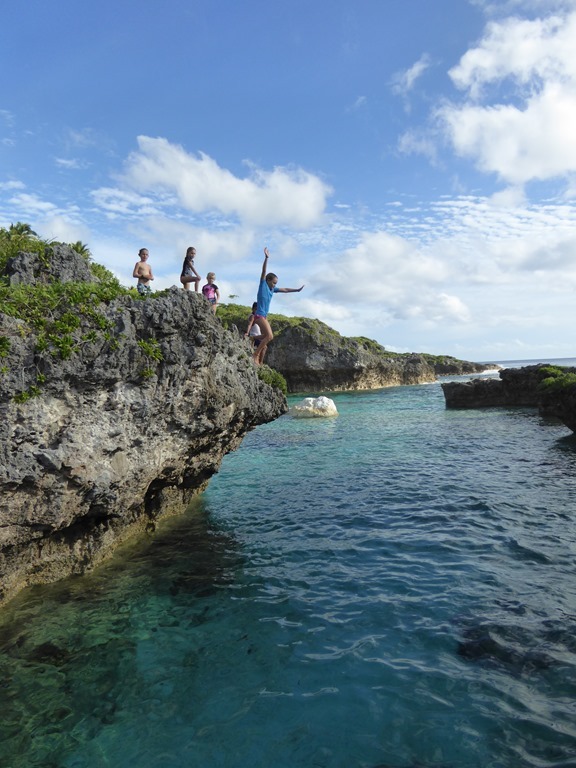 There was some coral there and the fish were quite good but the highlight was yet more cliff top jumping in that the kids indulged in. Great fun! 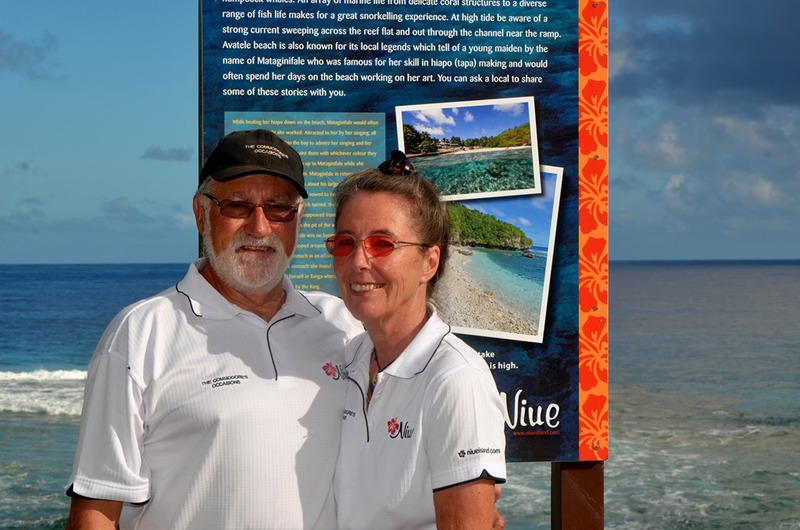 There was also time for a couple of dives with a firm called Magical Niue for Eleanor, Geoff and myself. We had a really good time with them. Although the water temperature was 26C, it felt noticeably colder than FP, needing 3mm suits rather than rash vests. 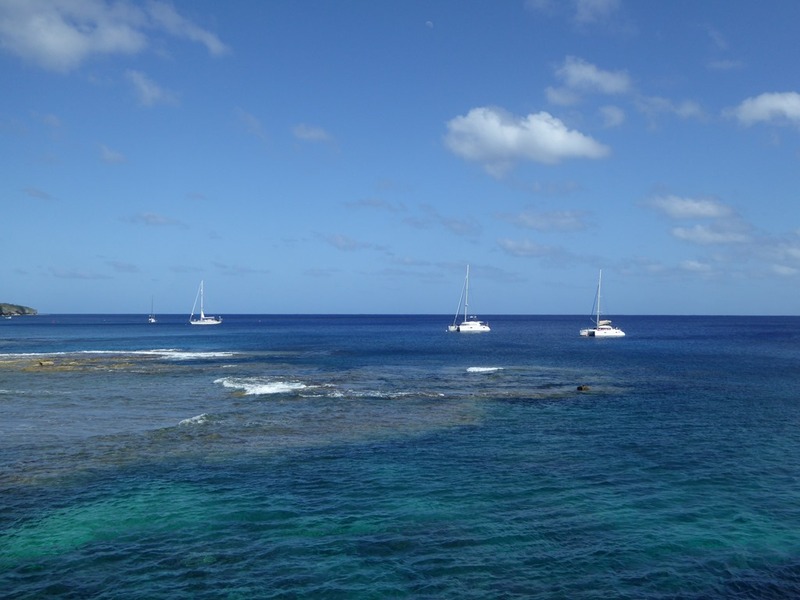 We did our first dive touring the coral mounts around the mooring field so they could assess Eleanor’s standard. 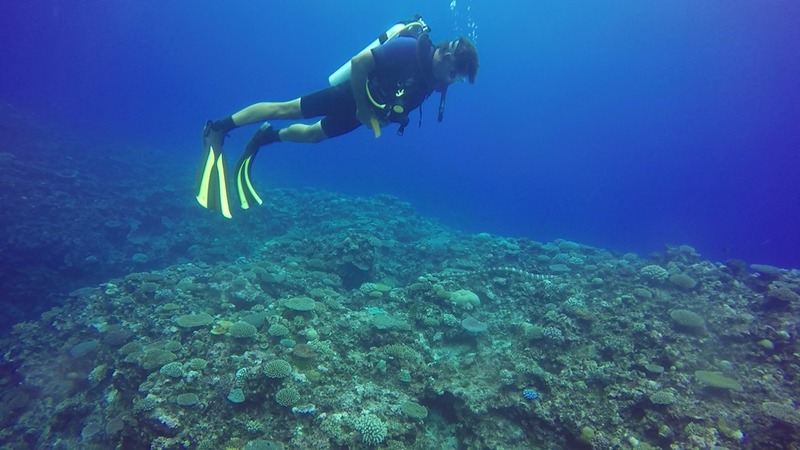 There was an amazing amount of hard fan coral. Not so many fish but we did see the biggest Napolean Wrasse we have ever seen. Huge. Between dives we lucked out. The pod of Spinner Dolphins that live around Niue came across to see us and Eleanor got the privilege of being dragged at the side of the rib, swimming amongst the 30 odd dolphin having fun at the front of the rib. Massive high! 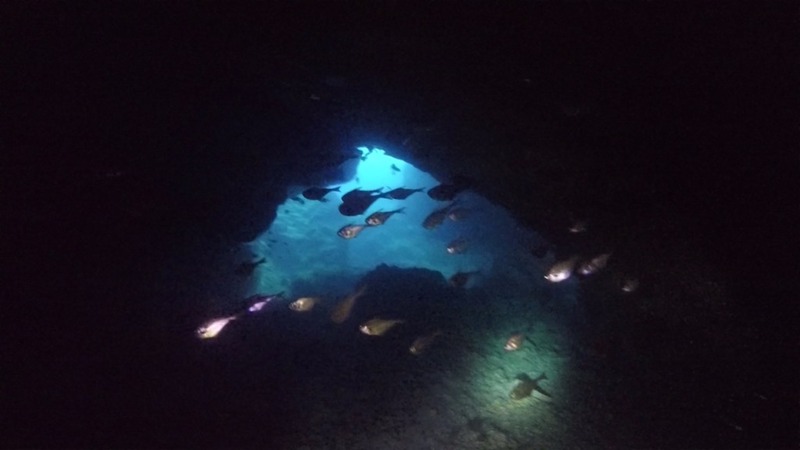 Our second dive was a visit to one of the caves about 500m S of the mooring field. 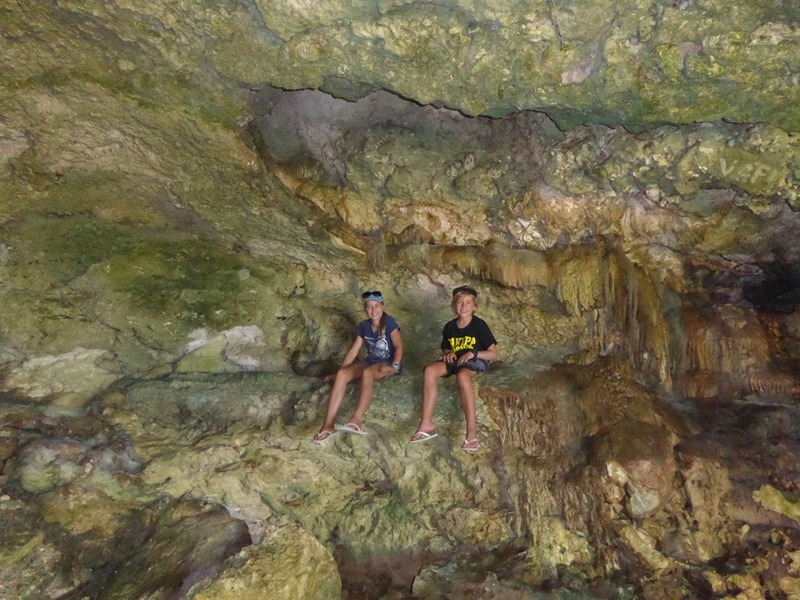 We swam in to the cliff face maybe 30-40m and then were able to surface inside the cave. After 5 minutes, we came out and had a tour of some of the canyons near the shore. There was a bit of surge and we had to work hard but Eleanor handled it like a champ. When we came up, Eleanor was so excited she went in to motor mouth mode, grinning hugely. The dive master, Ramon, made comment that she was technically the best junior they had seen, which just capped it off for her. By Mon, it was obvious that the front would hit us and that we would have a day of NW wind at about 25kts, decreasing and falling S as the Low went by. We ended up having the whole of Tuesday on the boat, unable to get off watching 4-5m seas break over the jetty. Whilst we had been in shelter to the Trades, we were now on a lee shore with a reef a whole 150m behind us. We had one alarming moment late afternoon. On hearing a unexpected noise, Eleanor went off to investigate. She came back to announce we were hanging on by one line only. 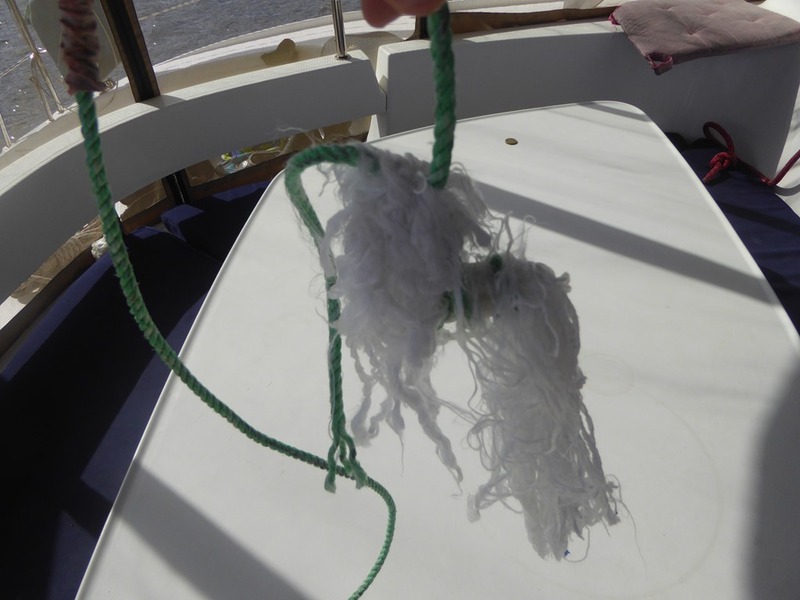 I worked out that the lifting buoy’s line, a floating plastic type, had wrapped around our port line and with the constant surging we were experiencing, had in effect sawn through it. We quickly replaced the damaged line and cut away the lifting float and line to ensure we weren’t caught out a second time. We really should have gone around the S end of the island to find relief but Lou was not keen to lose the “security” of our nice mooring. Having dived on several moorings (and had a go at putting new plates on for Keith on one of them), I was satisfied that the lines and fixings were strong enough for what we were in, even if it was uncomfortable. Even so, we stood watch all day and through the night with the engines running so if something did break we could quickly extradite ourselves. The wind eventually moved back in to the SE at 0330hrs on the Wed morning. It was a long 30hrs. The seas abated enough by lunchtime to be able to get people ashore. It was still a little adventurous but manageable. Lou was very keen to get to the coffee shop and stop moving! Geoff and I had a day of fixing boat problems. My genset had started to make smoke and I was pretty sure it was down to the exhaust elbow clogging up. It should have been an easy fix. Sadly the muppet that had changed my elbow at Grenada Marine had used cheap mild steel hex bolts and as I tried to undo them, they each broke off in turn. They will need to be drilled out. Tonga maybe, more probably Fiji before it is fixed. The other issue was my log and anemometer B&G electronics had decided to fail. My thanks to Geoff for coming across and using his expertise to track down the fault which was a rotten data lead connector causing a short. I got apparent wind back but I’ll need to wait for a new connector before I get depth, boat speed and a true wind speed again. With the delivery ship due in, the World Arc Rally about to arrive to nab all the moorings and the weather turning favourable, we booked out and planned to leave on Thu 25th May. 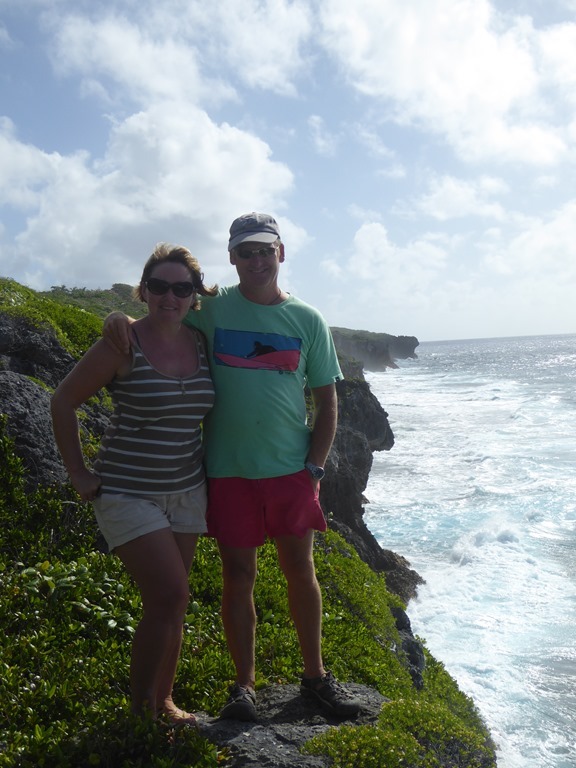 Perhaps we should have left with Pesto but if we had, we would not have had time to explore Niue as we did. It is a strange mix of island isolation and NZ civilisation. But so worth a visit. 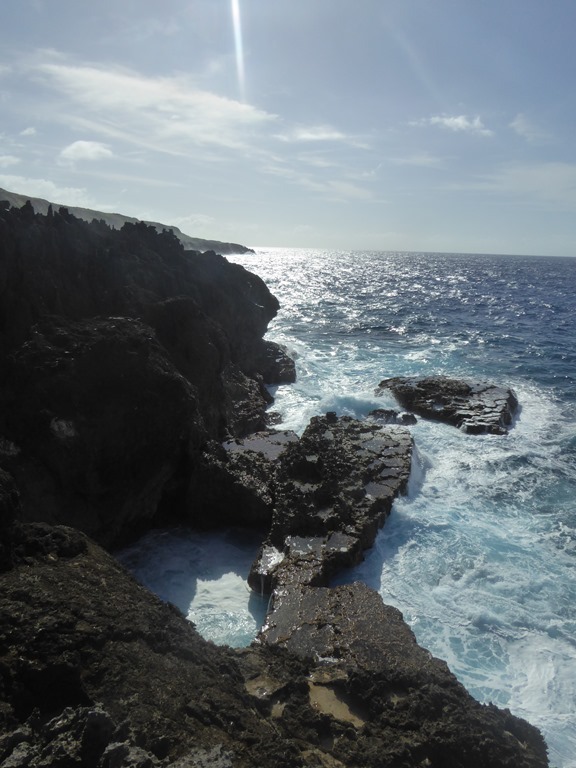 Don’t expect beaches but enjoy the fantastic pools, caves and snorkelling around the coast. I’d love to go back during the whale watching season. The whales come in to the bay and are often found of a morning sleeping under yachts. It can be too loud to sleep if they are singing. That would be an experience! 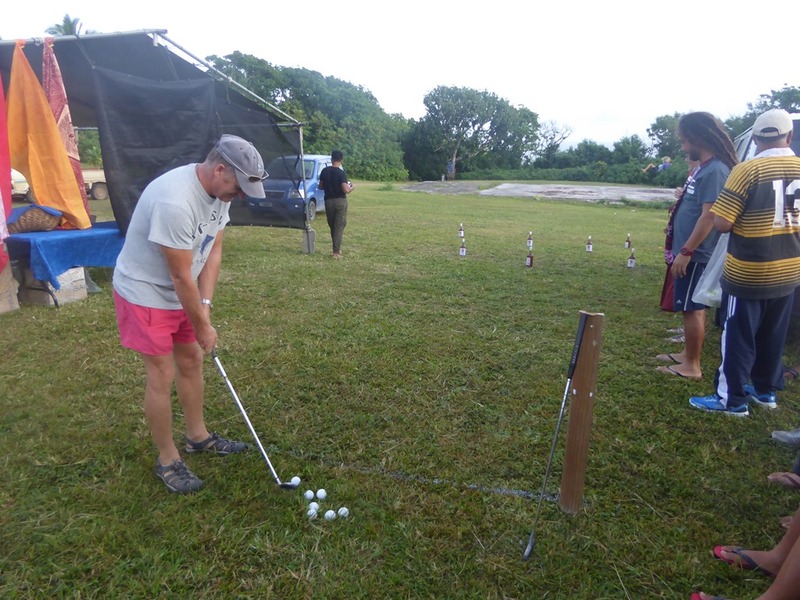 My only real regret was that we could not find time to play a round of golf at the 9 hole course opposite the airport. Great fun, said one man who had played it, although he was a little perturbed by the way the ball would hit a lump of coral and spring forward an extra 100m! Not easy for club selection. 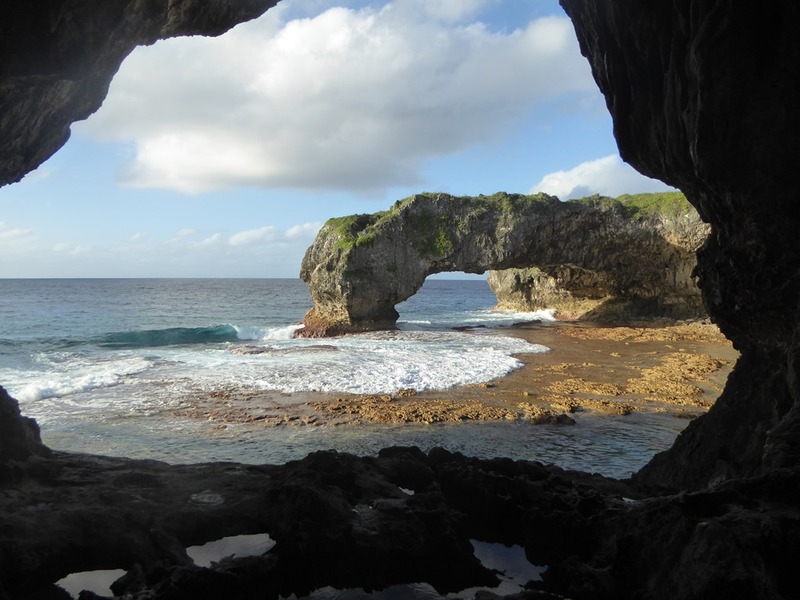 For those reading in NZ, Niue is on your doorstep and just a 3hr flight away. Go and enjoy but be prepared to go slow. The place is magical.